lechemusic: ¡Disclosure – Latch feat. Sam Smith (Official Video)! Marvelous UK music act Disclosure unveils a music video for their uplifting house track “Latch”. The single will be released on November 2nd, until then, enjoy the visuals and Sam Smith’s elevating vocals. lechemusic: ¡Disclosure – Latch featuring Sam Smith lechestyle: Red Ear Denim Shirt! Sibling duo Disclosure has revealed their latest track called Latch, featuring fresh singer Sam Smith on the vocals. Incredible tune, elevating house music at its best. Disclosure is now represented by UK label PMR Records, alongside artists like Jessie Ware and Julio Bashmore. 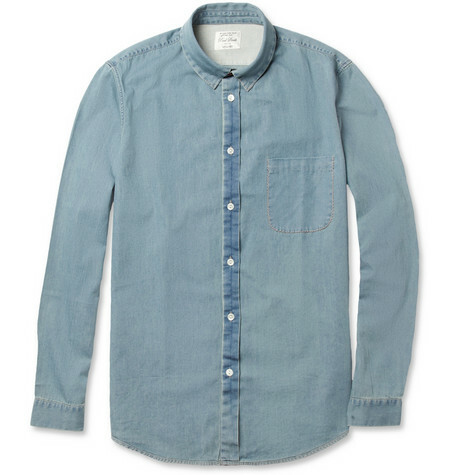 Denim shirts are completely right for this fall, here is a perfect faded example by Red Ear. Couple with colored trousers maybe in burgundy or mustard, and throw over a cardigan if you feel like it . Red Ear Lightweight Washed-Denim Shirt available at MR PORTER. lechemusic: ¡Disclosure – What’s In Your Head lechestyle: James Jeans Light Destres! Disclosure has published a new track called What’s In Your Head yesterday on soundcloud. The sound is very fresh, the beats are built well around the attitude vocals. Check it out below, very good stuff. Cool skinny jeans by James Jeans, works well with the light brown suede shoes in the picture.